1.Do you have Orthostatic Tremor? 2.Have you ever had a traumatic brain injury? 3.Have you ever been knocked unconscious? 5.Have you ever suffered whiplash from a car accident or similar traumatic event? 6.Have you ever had a seizure? 7.Have you ever suffered from chronic headaches? 8.Have you ever suffered from chronic dizziness? 9.Have you ever had a brain tumor? 10.Have you ever had brain surgery? 11.Have you ever had an MRI or CT scan of the head? 12.Was the MRI or CT scan normal? 13.Did the MRI or CT scan show brain lesions? 14.Have you ever had Lyme disease? 15.Have you ever been diagnosed with Parkinson’s disease? 16.Has a Parkinson’s diagnosis ever been changed in favor of an OT diagnosis? 17.Have you ever been diagnosed with MS (multiple sclerosis)? 18.Has an MS diagnosis ever been changed in favor of an OT diagnosis? 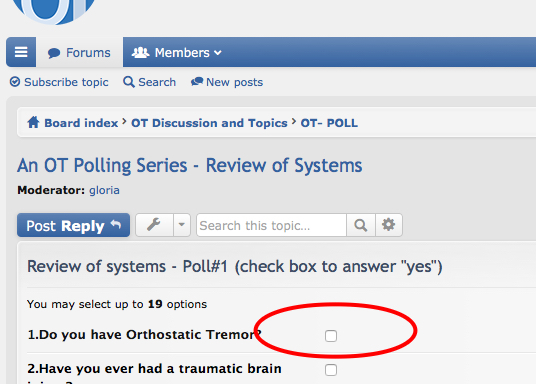 Check this box and then click on "Submit Vote"
This is the first in a series of polls designed to learn more about commonalities among those with Orthostatic Tremor. Am looking forward to participating and thank you so much for doing this. I can read the poll results but am unable to do the poll- so I would like to give an anecdotal response. I do have scoliosis and have been treated with a raised shoe because one hip was higher than the other. I stopped doing that a long time ago because the shoe was too heavy and dragged and the insert did not seem to accomplish anything. This poll reminded me that maybe I should have that looked into again. I also have had a spinal xray. Thanks for doing these surveys. Since the conference in Houston, my tremors which are visible have increased particularly on days without enough sleep or stressful times. I can see the poll but unable to respond When I was six I was hit on the head with a baseball bat during recess. I passed out, was diagnosed with a concussion and became dyslexic. I also have ongoing right side migraine headaches and have taken imetrix for nearly 20 years. I have had both MRIs and CAT scans of my brain and have abnormalities on my upper spine. I was diagnosed with POT after I fell and broke my ankle and leg after experiencing tremor after stopping on a staircase holding a computer tower in both hands. I was also diagnosed with essential tremors after 30 years taking lithium for bipolar and never entrapment in both arms causing numbness in both little fingers and half of each third finger. My answers would be no to all the other questions. How do you register to complete the questionnaire? I have had a series of spinal problems ultimately resolved by spinal fusion but no experience of brain trauma. The only dizziness experienced has come from the medications prescribed for OT. Always happy to contribute to the common (uncommon) cause. If you see the results of the poll and can't take the poll then you are likely not "logged into" the forum see the attached image below. Let me know if you have any additional problems. 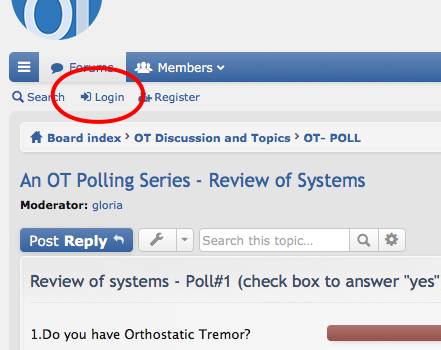 After you are logged into the forum you will see check boxes next to the questions. Click on the check box if your answer to the question is "yes"
This is a great poll. It would be great to correlate with even more co-entities. May I suggest the investigation of the following Prior to noticing OT symptoms such as: Sleep Apnea; Herniated Discs; Anxiety. Another correlation might be if anyone recalls having a tendency of almost habitually moving their legs while sitting prior to noticing OT. Something such as this might be a tell tale sign for early investigation or an aid in making a diagnosis prior to full blown tremor when standing. Also, it might be helpful to collect information as to how long people could stand at the time they first noticed OT symptoms vs when they were formally diagnosed.